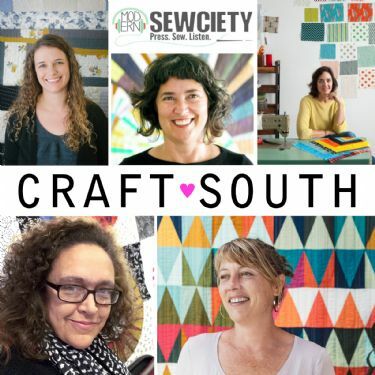 Anna Maria Horner, fabric designer and owner of CraftSouth, had a brilliant idea to get some of the fabulous and talented folks teaching and exhibiting at QuiltCon 2019 (which was held in her home turf of Nashville TN) to come over one night and do a ModCast with Stephanie from Modern Sewcity Podcast! It was such a fun event! Follow this link to hear the episode with yours truly, and be sure to check out the other episodes to hear Heidi Parkes, Sarah Bond, Tara Faughnan, Sherri Lynn Wood, Tula Pink, Carolyn Friedlander, and more!